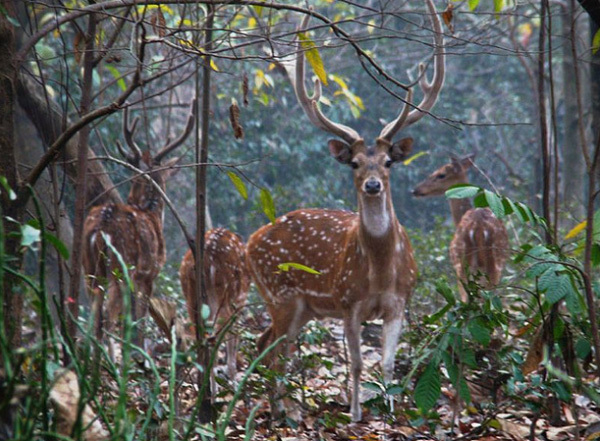 Places to see at Bethuadahari: The wildlife sanctuary covering nearly 500-bighas is one of the most biodiverse regions near Kolkata. Visitors to the forest are taken on a guided nature walk by a forest guide who spots the wild animals and birds for the visitors. The sanctuary has feed-pits located allover where you can spot the deers and wild hogs. There is also a Gharial (Indian Alligator) Rehabilitation Centre where you can spot a healthy family of eight Gharials at present basking under the sun. You would also find a refuge for tortoises and herons in a shallow lake within the sanctuary. Just near the entrance of the Bethuadahari Sanctuary, is a Nature Interpretation Centre where visitors can check exhibits of stuffed alligators and clay models. A few minutes walk from the Bethuadahari forest would take you to Bangariya Forest plantation on the other side of the highway. This plantation area of Sal trees is open and visitors and can drop in here to discover different varieties of birds and insects but it does not serve as refuge to wild animals. 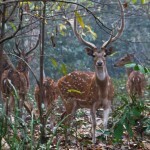 Nearby attractions of Bethuadahari: This wildlife sanctuary is located on NH-34 in Nadia District. It is 24 kms from Krishnanagar and very near to other touristic attractions like the temple town of Nabadwip (birthplace of Chatanya Mahapradhu) and Mayapur (ISCKCON temples). Bethuadahari also falls on the way to the land of the Nawabs – Murshidabad. If you are staying at Bethuadahari, you can take day-trips to Mayapur and Nadia too. Things to do at Bethuadahari: You can take guided walks on nature – trails throughout the forest spotting various animals, birds and insects within the sanctuary. 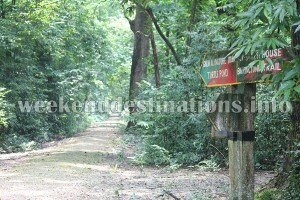 Visitors interested in butterfly and bird watching would find Bethuadahari very fulfilling. If you are interested in wildlife photography, then Bethuadahari will surely not disappoint you. A nice natural lake within the forest also has boating facilities for visitors. A visit to the Nature Interpretation Centre to view the exhibits of stuffed animals and clay models can be interesting too. How to reach Bethuadahari: There are regular trains to Bethuadahari (Lal Gola) from Sealdah and Kolkata station. You can also take any bus (private and Govt. buses) to Behrampur, Malda or siliguri from Kolkata and they would stop at Bethuadahari. 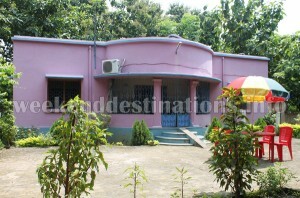 Bethuadahari is around 24 kms after Krishnanagar. Best time to visit Bethuadahari: It is one of the few forests in West Bengal, which stays open throughout the year, so you can plan your trip any weekend you prefer. The monsoons shroud the forest with greenery and the winters bring some migratory birds. Lodging and dining facilities at Bethuadahari: Budget private accommodations are available just on the opposite of the Forest Entrance Gate in Bethuadahari with AC as well as non AC rooms. You would also find a deluxe resort around 10 mins by car from the Forest Entrance Gate. Budget Accommodation: A nice Baganbari (Garden House) surrounded by towering Sal trees just opposite the Entrance Gate of Bethuadahari serves as a clean and modest staying option for the guests. The guesthouse overlooks Bethuadahari sanctuary and has one AC Four-bedded room, one AC Double-Bedded room and one non-AC Four Bedded room. It also offers kitchen facilities to the guests (you can cook for yourself), nice and clean Western Bathrooms with hot water Geysers, refrigerators and televisions. You can also park you car within the guesthouse premise. If you are not too keen in cooking yourself, then the guesthouse cook would prepare nice Bengali dishes according to your preference. The guesthouse manager can also arrange for local sightseeing cars to Krishnanagar, Mayapur and Nabadwip on request. Another attraction of this guesthouse is its backyard surrounded by trees, which are frequented by numerous birds. Deluxe Accommodation: If you prefer to stay in resorts, then Bethuadahari would not disappoint you either. 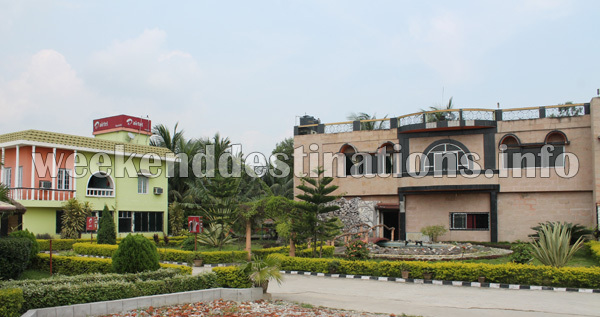 You can stay in a nice modern resort around 10 mins (by car) from the Forest area on NH-34, which is equipped with facilities like bar, multi-cuisine restaurant, AC and non AC rooms with attached western bathrooms, manicured lawns and few gazebos spread out over the lawn. 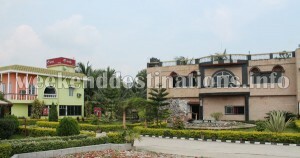 The resort overlooks lush green farmlands and has parking facilities too.